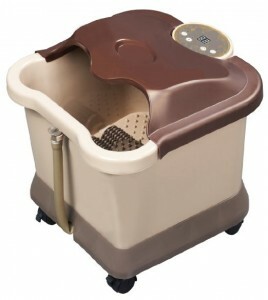 Complex foot reflexology is employed by this model from Carepeutic that is deemed by many as the best heated foot spa. As you may well know, stimulating certain areas on your soles can bring many benefits for your health. Enlisting the services of a professional specialized in foot reflexology can be, however, a bit steep and you may not always have the time to go visit a spa for getting such a treatment for your feet. The reflexology therapy offered by this unit is based on the massage rollers located inside the container. Their role is to give you a relaxing massage that will melt away the tension in your feet and calves. You will surely love the temperature control installed on the Carepeutic model. Practically, you will get to choose the temperature you want your water to have, in order to enjoy the best benefits of heated water therapy for your feet. A drawback simple hot water baths have is that the water gets cold, but this is not what you have to worry about if you are using this unit. Balanced and well maintained water temperature contributes to the great reputation this model has and many people praise it. A handy control panel allows you to pick your own settings for your convenience. Another aspect that is much appreciated by everyone who has used the Carepeutic foot spa bath so far is the easy of drainage. A built in drain valve makes it really easy for the user to drain the water, once they are done with the treatment. The mobile caster is an added benefit, as well. You will not have to carry the container in your arms all over the house in order to drain it. You will just need to drag it around and you can use this feature when you want to store away the foot bath, as well. Many people love getting a full fledge foot massage after a long day spent outside their home or doing chores around the house. Feet can easily become tensioned, sore and stiff, regardless of whether you are using them or you are simply sitting at the computer. 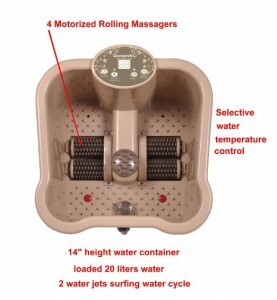 The rolling massagers and the water jets used by this foot bath give you a thorough foot massage just as you want. The half calf tall container ensures that your feet will be properly immersed in hot water so you can reap all the benefits. Besides the obvious advantages offered by hot water therapy, this unit helps with other health problems. A good foot massage has been proved to help with cramps, injuries, recovery after surgery, hemorrhoids, headaches, and various pains in the body. Those suffering from arthritis can also enjoy many great benefits as this type of massage relieves tension and stiffness from joints and muscles. Those who own this product say that it is really great at relieving pain and tension in the feet, but there are a few who mention a small issue. People with really large feet may experience problems when trying to fit their legs inside perfectly. Nonetheless, the advantages offered by this product surpass this small shortcoming.